The puppy course gives young dogs a big advantage. It is geared towards bringing out the natural abilities of all breeds. It is most effective when the dog is 4-5 months old. 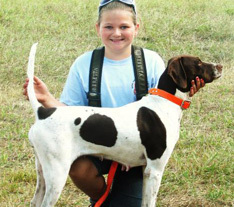 This 2-3 week course is designed to introduce your dog to live game birds, hunting in different types of cover, introduction to gun shots, retrieving birds on land and water, and also learning the routine of the training program. 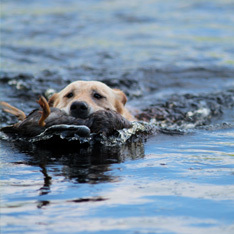 The gun dog course is designed to produce a well-rounded hunting companion with a strong foundation. Training the handler how to make proper corrections is also part of this course. The goal is to have a dog and handler team that are equally confident in their abilities. This will ensure that their time in the field together will be productive and enjoyable. This course is for dogs 6 months of age and older. The obedience part will be taught first and then transferred to the e-collar, using proper collar conditioning methods. The trained retrieve will be taught next. 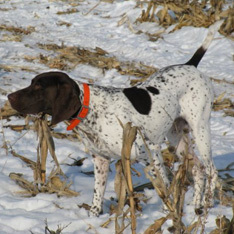 Pointers will be taught how to handle their birds properly. They will be trained to stand through wing and shot. They will be conditioned to stay at the range you prefer. The flushers and retrievers will be taught the foundation obedience in the same manner. They will be taught to quarter for hunting upland game if desired. They will also be taught to mark. Duration of this training course is 2-3 months. This course is for the Hunt Test/Field Trial competitor or the hunter that wants to take his dog to the next level. Your dog will be taught the finer points of being a highly trained and obedient dog. This course is designed to get your dog in good condition and to brush-up their bird handling skills. This cardio conditioning will have them ready, so when the season arrives they're at the top of their game. Seminar training is for the person that wants to run their dog, get training instructions, and then take their dog home and do the homework. It is also for the person that has had their dog trained and wants to keep their skills sharp. Seminars are a great way to get a finished dog ready for competition or that hunting trip. This course is for the non hunting dogs. The course is centered around having an obedient dog that listens to, and performs your desired commands, both in the household setting as well as out in public. It is designed to make your dog a good citizen and family pet.